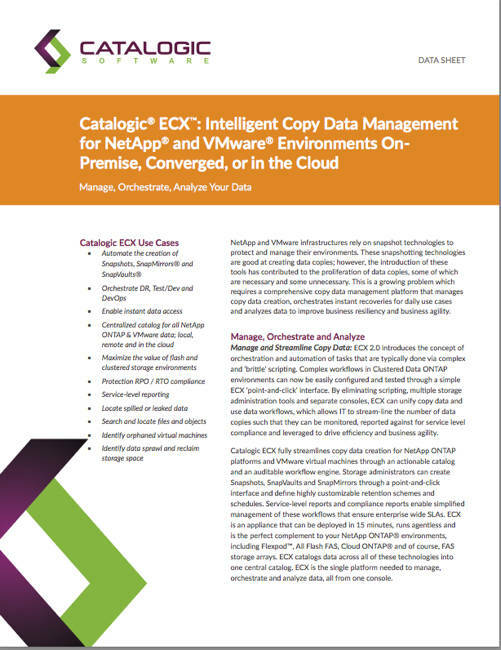 Catalogic has hustled out a flagship product update extending its copy data management to all VMware and NetApp ONTAP environments and supporting Docker. Copy Data Management (CDM) aims to save disk space by identifying duplicate and unwanted copies of data and helping you get rid of them. It also helps build automated data copy workflows to replace ad hoc scripting. Catalogic is also setting up a so-called ECX Marketplace into which it will introduce new features, report types for example, for customers to download. Customers could also upload their own developed ECX utilities or reports, with REST APIs, to the Marketplace. ECX 2.0 datasheet. Click image to get your own PDF copy. ECX 2.1 is available now with prices starting at $5,000/controller. You can download a free 30-day ECX evaluation.